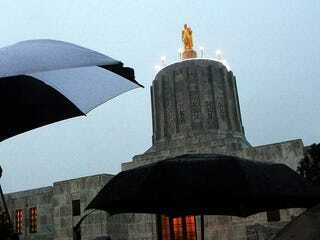 Today is the 75th anniversary of Oregon's Capitol (it's the third one, the previous two burned down). So, to celebrate it, lights were hauled to the top of the dome to turn the building into a giant birthday cake. I think it looks kinda neat.